Just 100 miles southwest of Shanghai lies Hangzhou, the “playground of Shanghai.” Sitting on the glorious West Lake Hangzhou is a perfect vacation spot for travelers near and far. 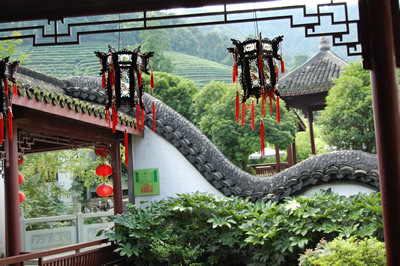 One of its many draws is an area just outside the city called Long Jing, Dragon Well. 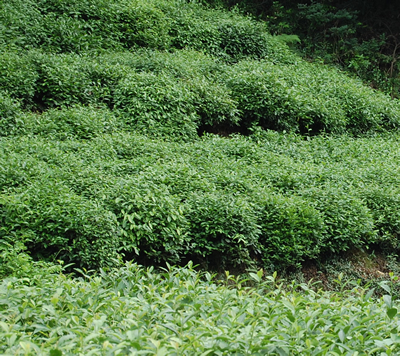 One of the most famous Chinese teas – Long Jing Tea – comes from there. Legend has it that a disguised emperor stayed there once in a farmhouse overnight. He had a dream that the entire area, with all its hills and valleys, hid a giant sleeping dragon. The dragon chose to reveal itself to the dreaming emperor foretelling much glory ahead. When he woke up he named the region Long Jing, Dragon Well. The most famous spring tea from Long Jing is collected in late March-early April and is usually referred to as either emperor tea or white tea. Only the newest top leaves are hand-picked and baked by hand, making it one of the more expensive teas you will encounter. The top leaves that are picked in April, May, and early June are considered green tea and are worth less, depending on the month they were picked. 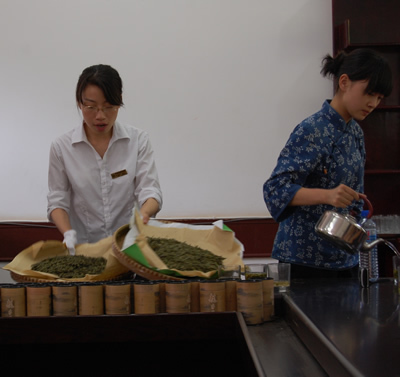 There are several working plantations in Long Jing that offer tea-tastings, tours of their facilities, and various educational lectures about tea. Our tour organizer told us of one particular farm only minutes from downtown Hangzhou and we decided to visit it. In this tea heaven , nestled in the hills covered with tea terraces we found our Mei Jia Wu family-operated tea plantation. Greeting us was of one of the descendents of the original founders of the farm, an attractive lady named Mei. Her English was impeccable and her attitude was very friendly. In the front yard of the main house a demonstration area was set up with three side-by-side basins used to bake the tea by hand. One of the workers came out and demonstrated the process to us. He greased one of the basins with a little bit of tea oil, used a straw basket to measure out a small quantity or tiny emerald-colored fresh tea-leaves, and began swirling them around the hot basin with his bare hands. 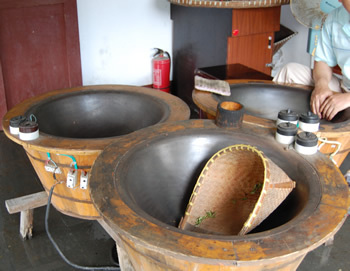 “This is the only way to bake Long Jing tea,” Mei told us. The method has not changed for centuries. 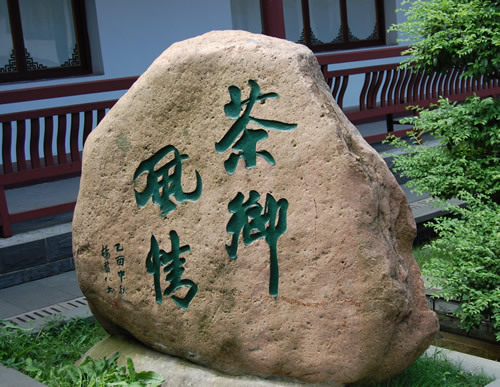 She then brought us into the courtyard that had a long decorative serpent body dsign running the perimeter and a large statue of Lu Yu, the preeminent Tang Dynasty tea scholar. Through the courtyard we reached one of the buildings that housed demonstration rooms and were asked to sit down around a large table for a tea ceremony. While we were enjoying our aromatic brew she told us about the wondrous properties of tea. Tea – young green tea especially – is full of vitamins and antioxidants. It is the best natural detoxicant, she affirmed. She then demonstrated to us just how well tea can “purify” our bodies from the inside. If I hadn’t seen this with my own eyes I wouldn’t have believed it. She poured some uncooked white rice into a cup, saying that the cup represents our stomachs and rice the food that we eat. Rice is pretty much neutral, however, we eat a lot of stuff that’s full of free radicals or oxidants that can damage our bodies. Mei then poured a little bit of iodine into the cup to signify the toxic oxidant-filled food we eat on a daily basis. The rice immediately turned brown. “Doctors tell you to drink a lot of water to help detox,” Mei said and poured some clean water into the cup of iodine-stained rice. The water turned a muddy-tan color though the rice got a bit lighter. Thus she demonstrated that while water helps, it only dilutes the concentration of toxic substances but does not neutralize them. She poured some of the dirty rice-water and rice out into a clean cup and added more water, which made the liquid appear even lighter but still muddy. “Look what even a few spoonfuls of tea can do,” she proclaimed and then added some steeped tea into the glass that had the lighter-colored water and rice. She swirled the glass around and like some miracle, the water turned clear and the rice white. She then did the same thing to the original glass. Though it took a bit more tea and more swirling, the liquid eventually turned clear and the rice regained its original color. I was awestruck and the rest of the people in the group began to whistle and applaud. Even those of us who knew about the healing properties of tea had never seen such a persuasive practical demonstration. “Drink green tea every day and you will live 100 years,” said Mei concluding her demonstration. Several baskets of various spring teas were then brought out. She taught us how to tell the different teas apart by sight, smell, and taste and offered to personally fill and seal some tins for us to take home. The emperor tea was very affordable this year, she informed us, only 300RMB (approximately $45) for 100 grams. The other teas were a bit cheaper. The plantation also had a large store that sold local plum wine and various candies and snacks made out of tea. Beautiful tea sets and cups were for sale as well, but they were pricier than at the various markets we’d been to previously. While the tea ceremony supplies can be purchased cheaply in Shanghai’s many markets it is much safer and more cost-effective to buy the tea straight from the growers. You know exactly what you are getting and you eliminate the middle-man. This entry was posted on Sunday, September 21st, 2008 at 10:05 am	and is filed under Geotagged, History, Must See Geography, travel. You can follow any responses to this entry through the RSS 2.0 feed. You can skip to the end and leave a response. Pinging is currently not allowed. Thanks so much for sharing your tea wisdom with us! I loved the experiment on the purifying properties of Green Tea. I was wondering if you learned about any regional differences in types of tea…Is there anything special about the tea that grows in Hangzhou because of climate, soil, etc., or is all tea grown equally? Thank you for your comment. While all tea plants are essentially the same the climate and the soil produce curious differences. Also, the way different teas are gathered and prepared makes a huge difference. Hangzhou tea is the best-known spring tea. It’s usually gathered very early in Spring and it must be consumed fairly rapidly. Other green teas can be stored for a while and even aged. It was so interesting to read your site. A group of eight, including me from Nashville, Tennessee, just got back on September 24, 2010, from a nine day trip to Shanghai and Beijing,China. You helped me relive every moment at the tea plantation. Thank you! My Singapore friend told me that it is too acidic and harmful for our body if we soap the Longjing tea leaves in the cup and keep adding water for drinking. Please advise if this is true. Thanks. Long Jing is my favourite tea and I’m planning to visit Shanghai in October or November, so I have added this to my list of things to do. 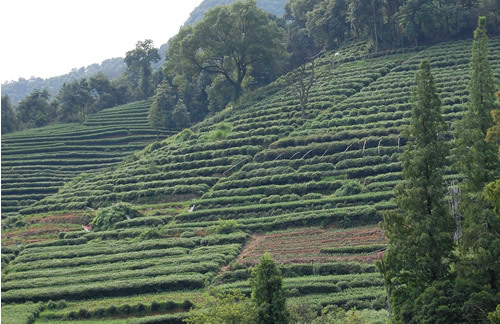 I have always wanted to visit a tea plantation, so this one looks like a good choice. GRAET PLACE TO VISIT. GIVES ONE THE TOTAL EXPERIENCE OF BIG FAM, CULTURED TAE GARDENS AND EXPERT STAFF. QUITE COMELY. TEAS SAMPLES WERE EXPLANED CLEARLY AND SAMPLED TEAS WERE QUITE REFRESHING. MY GUIDE AND I HAD A NICE TIME AS THE HOSTESS PACKAGED MY PURCHASE OF TEA THAT STILL IS FRESH AND TASTY, SHARED WITH MY FRIENDS HERE IN THE STATES, MASSACHUSETTS, IN THE BOSTON AREA, TOWN OF NORTH READING, WHERE I WORK AND LIVE. THE FARM ALLOWS YOU TO CAREFULLY STROLL AND PHOTOGRAPH IN THE ROWS OF TEA PLANTS AND HAPPY TO EXPALIN THE DIFFERENT TEA CROPS. I WILL ALWAYS REMEBER THE SPECIAL CARE THESE PEOPLE TAKE TO SEAT, PACE THEIR EXPLANATIONS, PROVIDE A CLEAN AND CULTURED TEA SIT AREA AND KEEP THEMSELVES ATTRACTIVE, CONSIDER MY REQUSTS FRO STORAGE SIZE PURCHASES AND DUTIFULLY PERFORM REGULAR FUNCTIONS. THE GROUNDS ARE CLEAN AND SPOOTLESS, FACILLITIES THE SAME AND ORGANIZD WITH A LARGE AND BEAUTIFUL SOUVENIER STORE. THE MISTY HILS WERE A BONUS EXPERIENCE IN THE REALM OF ANCIENT WONDERS NOW BROUGHT TO LIGHT IN PERSON. BRAVO CHINA! A WONDER OF WORD CLASS IN MY OPINION! WHEN I RETURN TO CHINA LONGJING WILL BE AT THE TOP OF MY LIST! GAN BEI! Good morning from Quang Trung International Co-operation Company Vietnam (QTC). We has the nonor inform the latter that arrange the studytour for Ministry of Agriculture & Rural Development’ group to China from 4-10 December, 2011. This study tour at promotion of agriculture exchange and mutual understanding between the agriculture of Vietnam and China. The objective of study tour is learning about methods of processing and management of food quality and safety of processed products, safe agricultural products consumption system, safe tea & fruit certification, methods of management and production of standard, qualified, and safe agro-products. The time of expection for the studytour is from 5-10 December, 2011. The list and position of team members in attachments. We would like to request the latter’s kind help in arrange the meeting at your office & visits tea or fruit farms in Hangzhou. Your assitance is of great importance and hightly appreciated. I visited area recently and purchased green tea pills. How can I reorder ?? I want to import long jing cha to South Africa, how do I do it? I was just here and came home with emporors tea. I’m now trying to figure out if it is possible to order more? Is there a website site? There is a telephone number on my packaging; should I perhaps just call? A philosophy instructor and personal chef, my interests are very diverse and include many things from travel to sports and everything in between.